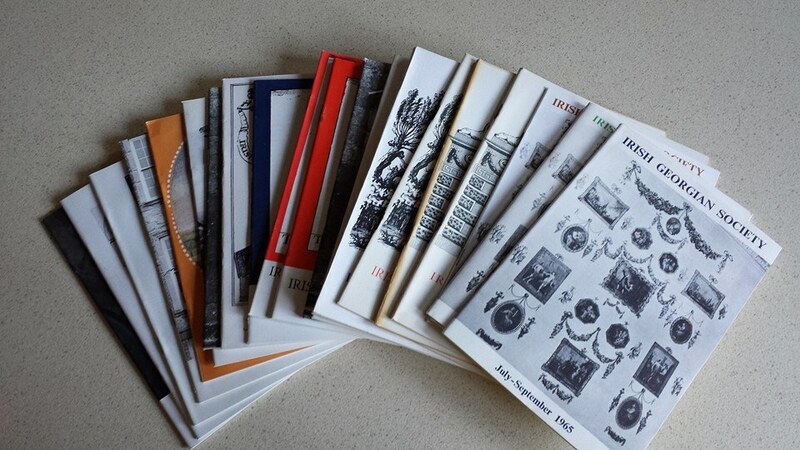 In January 2015, Limerick’s Life posted a quiz to win the pictured selection of Irish Georgian Society Bulletins from the 1960s to the 1980s which showcased a range of topics of importance from the Irish Georgian Society. The competition is now closed and the 20 booklets have made their way to their new owner where they will hopefully be enjoyed for many years to come. The Georgian era is a period in British and Irish history from 1714 to c. 1837. It is named after the Hanoverian kings George I, George II, George III and George IV, and ended with Queen Victoria’s ascension to the throne. The Irish Georgian Society was founded in 1958 by the Hon. Desmond Guinness, of the famous brewing family and his first wife Princess Marie Gabrielle of Urach to help to preserve Irish architecture of all periods. In 1991, Desmond FitzGerald, 29th Knight of Glin was appointed as President of the Society. Desmond FitzGerald and was educated at the University of British Columbia and Harvard University. He worked at the Victoria and Albert Museum in London, in the furniture department. FitzGerald was the last Knight of Glin; as he had no sons and the title cannot be passed to a daughter, the title became dormant with his death in 2011.